Five concerts, eleven different works (not counting the encores), three countries and all in the space of ten days. Those eleven works ranged from Haydn to Berg and included three concertos. Most audiences imagine, I guess, that when a solo pianist arrives to give a performance, he has spent the past week practising and will then spend another week practising for his next appearance. That's not how it works, especially when the pianist is Marc-André Hamelin, who has just completed a short tour of three Asian cities. The most astonishing thing about him is the enormous scope of his repertoire. As you can see, for his Hong Kong recital (and, for the benefit of those students and teachers who have no idea how to plan a recital programme, this seems to be a pretty good example) he leapt from Haydn to Stockhausen with barely a pause for breath. I find it difficult to re-adjust my musical sensitivities between these two with the music in front of me; it almost defies comprehension how he managed it entirely – as with every work he played – from memory. He is truly a phenomenal musician. He is also a remarkable pianist, able to communicate the soul of the works he plays with an intensity which makes for utterly compelling listening. Technically superb, with fabulously fluent and flexible fingers and always marvellously in command of the music, it is pure joy just to watch him play. Add to all that his extraordinarily intuitive musicianship and you have one of the musical wonders of our age. The question I ask myself, however, is, with a repertoire so wide-ranging, can he really be equally at ease and assured with it all? Where, I wanted to know, were his strengths and weaknesses? For my mind, unquestionably the best performance was the Beethoven Fourth Concerto he gave with the Singapore Symphony Orchestra on 3rd March. As I wrote in my Straits Times review, he "brought a whole new dimension" to this, through his deeply contemplative approach to the second movement, as well as through his two self-composed cadenzas (which the Straits Times's sub-editor highlighted in the clever headline, "Bizarre, Eccentirc, Absorbing"). And the weakness? Surprisingly, the performance which I found least rewarding was that of the Franck Symphonic Variations which he did with the Hong Kong Philharmonic on Friday 9th March. I register surprise at this because this middle-Romantic French idiom would seem to suit him perfectly. But the performance, while full of brilliant moments and passages of great sensitivity, just did not hold together. For the first time in my long acquaintance with the work, I found it surprisingly incoherent and rambling. My suspicion is, however, that the fault did not lie with Hamelin but with the conductor. While Okko Kamu in Singapore had been the perfect partner, neither leading nor following but showing an instinctive understanding of what Hamelin wanted to say, Shao-Chia Lü in Hong Kong seemed to be following his own agenda. He got some fine playing out of the orchestra, and the work's manifest charms were fittingly projected with great aplomb. But he seems to be a conductor who chases the big effect and doesn't always grasp the music's fundamental architecture. Lü is a conductor who likes his orchestra to see what he wants through a lively podium presence. He leaps and dances, swoops and swoons in a manner which would certainly inspire any youth orchestra but which probably serves only as an irritant to the seasoned professionals of the HKPO. They would rather be left to play the music as they want, the conductor's role to keep them in time and to draw the various strands together. That was vividly displayed in the concert opener, Ravel's La Valse, where Lü emphasised the weird and the grotesque at the expense of the magical and haunting. He certainly danced the music, but from where I sat his dance was more in the nature of a polka schnell than a valse. Conductors who really understand how to handle concertos are rare. For all his shortcomings in other areas, Kees Bakels, the founding Music Director of the Malaysian Philharmonic, is one of the most intuitive concerto conductors of our time. It was fortunate that at least once during his whistle-stop tour of Asia, Marc-André Hamelin came up alongside another. Hey Marc, Are you still with the Trinity? We met at CUHK some while ago. Nicely written in the Hamelin's concert. Let me know if you are around. I enjoyed your review! I stumbled upon your blog when searching for a recital poster of him. As a piano teacher in Macau until June from the U.S., I'm checking out the music culture here and have enjoyed it thoroughly so far. 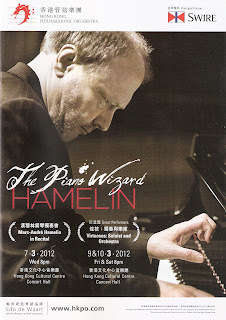 I was able to catch the second night as I arrived in Hong Kong as Mr. Hamelin was playing. I wish I would have caught it but your review gives me some solace. Will or is there a recording of the Beethoven 4 and the Singapore Symphony? It's my favorite concerto since I was a child. My travel blog about music, education, religion, and cycling is here Looking forward to more reviews!